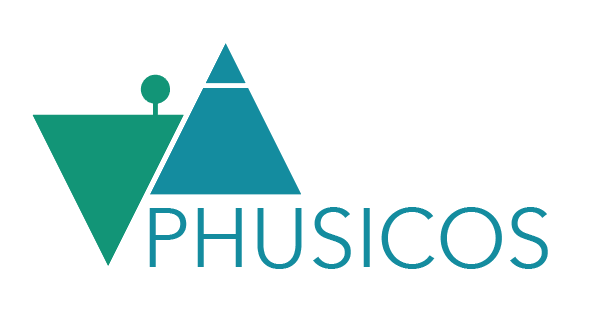 The PHUSICOS consortium comprises 15 partner organisations, three of which are end-user organisations. All partners are experienced with the implementation of national, European and international projects. The figure below illustrates the management and organisational structure of PHUSICOS. Organisational structure of PHUSICOS (number of partners indicated in parenthesis; W indicates woman, M indicates man among the Coordination Team or WP Leaders). The personal resources include a Coordination Team, a Steering Committee (SC), WP Leaders, end-user partners and contact partners at their respective case study sites, and two advisory bodies – the PHUSICOS External Reference Committee (PERC). 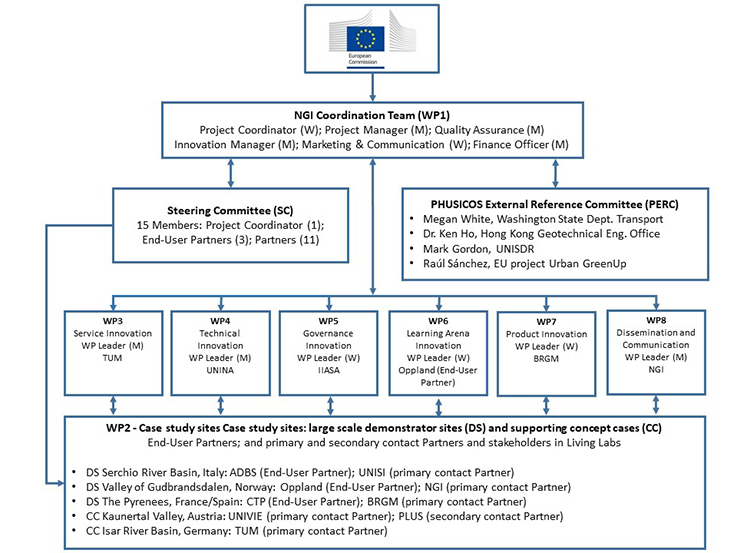 This management structure follows best-established practices for management organisation and decision-making and allows the Project Coordinator (PC) to oversee and as needed delegate responsibility for the execution and reporting of the research tasks to the WP or demonstrator site (DS) and concept case (CC) levels. The SC oversees the progress and development of the innovation actions during the project period. A brief description of each component of the key components of the organisational structure is provided below. Administrative, marketing and communication, as well as finance support is also provided by NGI. The Coordination Team will lead all tasks within WP1 Coordination and project management. This include, managing financial and administrative activities, uphold open communication with the Commission, among partners and especially with WP leaders for the day-to-day scientific and innovation coordination in the project. The main decision making body in PHUSICOS is the Steering Committee (SC), which is chaired by the Project Coordinator and includes one representative from each partner. SC meetings will take place every six months throughout the duration of the PHUSICOS project and will be held in conjunction with annual meetings and the Stakeholder integration workshops. Implementing NBSs at the case study sites is the central activity of PHUSICOS as reflected in over 50% of the budget dedicated to initiating NBSs. The SC is also responsible for managing these resources and for selecting which NBSs will be implemented. The SC is comprised of 15 members (one representative from each consortium partner) and will review NBS proposals and requests for funding as proposed by the end-users and partner(s) associated with the demonstrator or concept case sites. The WP leaders will coordinate and monitor the work implemented in each of the work packages as well as budgeting and reporting tasks at the WP level. The WP leader is responsible for the quality of their respective deliverable. The PERC is comprised of international experts that have agreed to support PHUSICOS through knowledge exchange of best practices and experiences with implementing nature-based solutions. PERC members will meet annually in conjunction with the PHUSICOS Stakeholder Integration Workshops. Washington State Department of Transportation, USA, Megan Jeannine White, P.E. The role of the PERC is to provide inspiration, their own expertise and feedback to the Consortium, as well as review key deliverables as needed and coordinated with the relevant WP leaders.